Offering you a complete choice of products which include sliding and folding partition, aluminium partition door, sliding partition, heavy duty steel partition and rolling door partition system. Suitable for tempered glass panels 8mm to 12mm. We are the topmost company engaged in offering Sliding and Folding Partitions. Our offered Sliding and Folding Partitions is manufactured using standard quality raw material and experienced labors at vendors end. Apart from this, it is extremely well-liked in the market due to their superior finish, robust structure, and nominal prices. It is also checked on various quality levels before delivering to our prestigious clients. 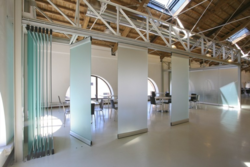 A heavy-duty sliding, folding system of frameless glass panels. 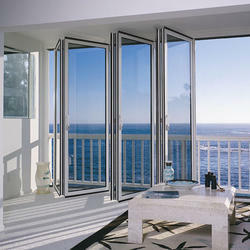 Our company has been acknowledged for offering Aluminium Partition Doors to our clients across the nation. It is designed and made keeping in view the various needs of the clients at vendors end. 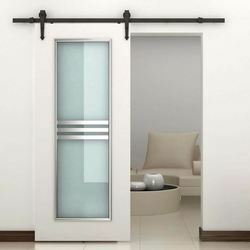 These doors are highly demanded their sturdiness and durability. In addition to this, these Aluminium Partition Doors is rigidly tested on various quality parameters. Sliding folding system for Aluminium doors. We are the famous company engaged in offering Sliding Partition. We believe in effective and timely delivery of product once ordered by our clients. It is manufactured using a very high-quality raw material as per industry quality standards at vendors end. The sliding parking is widely used in various sectors in order to control the air pressure, air temperature, and air movement. Heavy duty Partition system for Sliding and stacking glass panels. 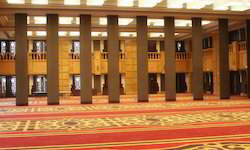 Our company is devotedly involved in offering a broad range of Heavy Duty Steel Partition. that is widely used in various offices, studios, and other such places. For reasons of quality maintenance, the offered Roll Up Door are manufactured as per the industry set guidelines and norms.